This April, the Fashioned from Nature exhibition opens at the V&A Museum in South Kensington, where it will explore the complex relationship between fashion and nature. Spanning four centuries, the exhibition will feature fashionable dress and textiles, natural history specimens, as well as key manufacturing processes, and it invites visitors to think about the materials of fashion and the sources of their clothes. connects the hook to the bird’s head. The bird’s head is attached to the fourth part, a fringe of copper dangling beads that fall like a necklace from the bird’s throat. The playful juxtaposition of the metal insect by the bird’s beck, suggests it is the bird’s prey. The birds’ heads feature an enchanting array of aquamarine, cobalt, and turquoise blue plumage. The natural beauty of which is in stark contrast to the manmade fixtures that engineered the heads into earrings. These animal-based earrings are reflective of a period when the natural world was plundered to supply fashionable consumers’ unquenchable appetite for animal products. Materials such as ivory, tortoiseshell and feathers were transformed into jewellery, hair combs, pins, brushes, hats and fans. Fashion had a huge impact on the natural world. Between 1800-1850, the UK’s annual ivory imports increased from 119 to 458 tonnes. [i] In 1878, the UK alone, imported over 30 tonnes of tortoiseshells (the equivalent of 17,000 Hawksbill sea turtles). [ii] Mrs Haweis, a well-known fashion commentator of the time, wrote about the ‘wholesale destruction’ of over 30 million birds to adorn hats, muffs and screens in her 1887 article ‘Smashed Birds’. [iii] In response to the destruction, dwindling animal numbers and subsequent rising costs for animal products, scientists developed artificial alternatives and animal protection societies were established. 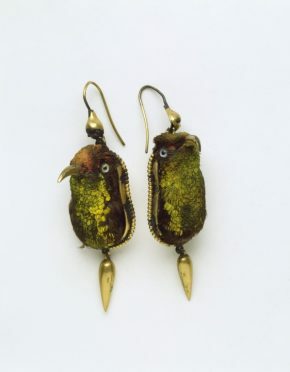 These earrings are one of several accessories fashioned from nature to be housed in the V&A Museum of Childhood. On display and in our stores there are pairs of Hummingbird earrings, as well as fans, boxes and notecases made from shells, feathers and skins. These items are from the Animal Products collection, which made up one of the Museum’s three initial collections (the other two were the Food Collection, and P.L. Simmonds’s ‘Collection illustrating the utilisation of waste products’). The Animal Products Collection contained everything from the sublime to the surreal, including a stunning shell snuffboxes and human hair. Simmonds and Lyon Playfair formed it in 1857. 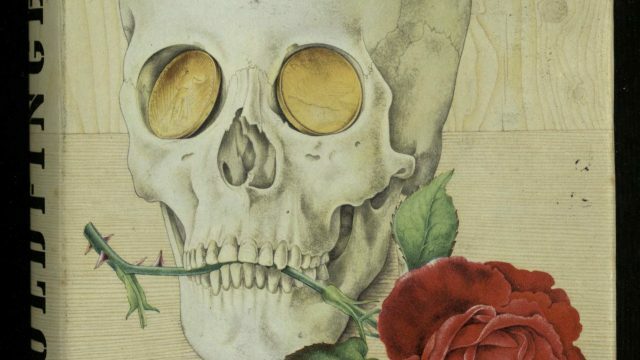 The intension for the collection was to elucidate the public to the creatures, food and materials in their lives. The collection was first housed at the V&A in South Kensington, but along with the Museum’s cast iron building, the collection was moved east to what is now the V&A Museum of Childhood in Bethnal Green. 161 years may have passed since these items were first displayed, but with Fashioned from Nature they are on public display again and continue to serve the same purpose, highlighting the synergy between man, nature and fashion. Fashioned from Nature is open on 21 April 2018. To research the V&A Museum of Childhood’s animal products please visit here for more information.